Not to be confused with Noah's Ark. The Ark of the Covenant (Hebrew: אָרוֹן הַבְּרִית, Modern: Arōn Ha'brēt, Tiberian: ʾĀrôn Habbərîṯ), also known as the Ark of the Testimony, is a gold-covered wooden chest with lid cover described in the Book of Exodus as containing the two stone tablets of the Ten Commandments. According to various texts within the Hebrew Bible, it also contained Aaron's rod and a pot of manna. Hebrews 9:4 describes: "The ark of the covenant [was] covered on all sides with gold, in which was a golden jar holding the manna, and Aaron's rod which budded, and the tablets of the covenant." 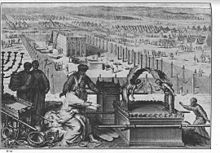 The biblical account relates that, approximately one year after the Israelites' exodus from Egypt, the Ark was created according to the pattern given to Moses by God when the Israelites were encamped at the foot of biblical Mount Sinai. Thereafter, the gold-plated acacia chest was carried by its staves while en route by the Levites approximately 2,000 cubits (approximately 800 meters or 2,600 feet) in advance of the people when on the march or before the Israelite army, the host of fighting men. When carried, the Ark was always hidden under a large veil made of skins and blue cloth, always carefully concealed, even from the eyes of the priests and the Levites who carried it. God was said to have spoken with Moses "from between the two cherubim" on the Ark's cover. 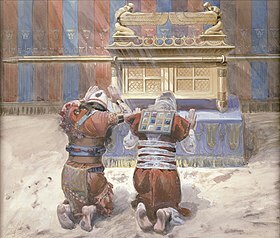 When at rest the tabernacle was set up and the holy Ark was placed in it under the veil of the covering, the staves of it crossing the middle side bars to hold it up off the ground. According to the Book of Exodus, God instructed Moses on Mount Sinai during his 40-day stay upon the mountain within the thick cloud and darkness where God was and he was shown the pattern for the tabernacle and furnishings of the Ark to be made of shittim wood to house the Tablets of Stone. Moses instructed Bezalel and Oholiab to construct the Ark. In Deuteronomy, however, the Ark is said to have been built specifically by Moses himself without reference of Bezalel or Oholiab. The Book of Exodus gives detailed instructions on how the Ark is to be constructed. It is to be 2​1⁄2 cubits in length, 1​1⁄2 in breadth, and 1​1⁄2 in height (approximately 131×79×79 cm or 52×31×31 in). Then it is to be gilded entirely with gold, and a crown or molding of gold is to be put around it. Four rings of gold are to be attached to its four corners, two on each side—and through these rings staves of shittim-wood overlaid with gold for carrying the Ark are to be inserted; and these are not to be removed. 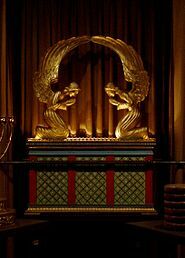 A golden lid, the kapporet (translated as "mercy seat" or "cover") which is covered with 2 golden cherubim, is to be placed above the Ark. Missing from the account are instructions concerning the thickness of the mercy seat and details about the cherubim other than that the cover be beaten out the ends of the Ark and that they form the space where God will appear. The Ark is finally to be placed under the veil of the covering. The biblical account continues that, after its creation by Moses, the Ark was carried by the Israelites during their 40 years of wandering in the desert. Whenever the Israelites camped, the Ark was placed in a separate room in a sacred tent, called the Tabernacle. When the Israelites, led by Joshua toward the Promised Land, arrived at the banks of the Jordan river, the Ark was carried in the lead preceding the people and was the signal for their advance. During the crossing, the river grew dry as soon as the feet of the priests carrying the Ark touched its waters, and remained so until the priests—with the Ark—left the river after the people had passed over. As memorials, twelve stones were taken from the Jordan at the place where the priests had stood. In the Battle of Jericho, the Ark was carried round the city once a day for seven days, preceded by the armed men and seven priests sounding seven trumpets of rams' horns. On the seventh day, the seven priests sounding the seven trumpets of rams' horns before the Ark compassed the city seven times and, with a great shout, Jericho's wall fell down flat and the people took the city. After the defeat at Ai, Joshua lamented before the Ark. When Joshua read the Law to the people between Mount Gerizim and Mount Ebal, they stood on each side of the Ark. We next hear of the Ark in Bethel where it was being cared for by the priest Phineas the grandson of Aaron (where 'Bethel' is translated 'the House of God' in the King James Version). According to this verse it was consulted by the people of Israel when they were planning to attack the Benjaminites at the battle of Gibeah. Later, however, the Ark was kept at Shiloh, another religious centre some 16 km (10 mi) north of Bethel, at the time of the prophet Samuel's apprenticeship, where it was cared for by Hophni and Phinehas, two sons of Eli. A few years later the elders of Israel decided to take the Ark out onto the battlefield to assist them against the Philistines, after being defeated at the battle of Eben-Ezer. They were, however, heavily defeated with the loss of 30,000 men. The Ark was captured by the Philistines and Hophni and Phinehas were killed. The news of its capture was at once taken to Shiloh by a messenger "with his clothes rent, and with earth upon his head." The old priest, Eli, fell dead when he heard it; and his daughter-in-law, bearing a son at the time the news of the capture of the Ark was received, named him Ichabod—explained as "The glory has departed Israel" in reference to the loss of the Ark. The mother of the child Ichabod died at his birth. The Philistines took the Ark to several places in their country, and at each place misfortune befell them. At Ashdod it was placed in the temple of Dagon. The next morning Dagon was found prostrate, bowed down, before it; and on being restored to his place, he was on the following morning again found prostrate and broken. The people of Ashdod were smitten with tumors; a plague of mice was sent over the land. The affliction of boils was also visited upon the people of Gath and of Ekron, whither the Ark was successively removed. After the Ark had been among them for seven months, the Philistines, on the advice of their diviners, returned it to the Israelites, accompanying its return with an offering consisting of golden images of the tumors and mice wherewith they had been afflicted. The Ark was set up in the field of Joshua the Beth-shemite, and the Beth-shemites offered sacrifices and burnt offerings. Out of curiosity the men of Beth-shemesh gazed at the Ark; and as a punishment, seventy of them (fifty thousand and seventy in some translations) were smitten by the Lord. The Bethshemites sent to Kirjath-jearim, or Baal-Judah, to have the Ark removed; and it was taken to the house of Abinadab, whose son Eleazar was sanctified to keep it. Kirjath-jearim remained the abode of the Ark for twenty years. Under Saul, the Ark was with the army before he first met the Philistines, but the king was too impatient to consult it before engaging in battle. In 1 Chronicles 13:3 it is stated that the people were not accustomed to consulting the Ark in the days of Saul. At the beginning of his reign over the United Monarchy, King David removed the Ark from Kirjath-jearim amid great rejoicing. On the way to Zion, Uzzah, one of the drivers of the cart that carried the Ark, put out his hand to steady the Ark, and was struck dead by God for touching it. The place was subsequently named "Perez-Uzzah", literally "Outburst Against Uzzah", as a result. David, in fear, carried the Ark aside into the house of Obed-edom the Gittite, instead of carrying it on to Zion, and there it stayed three months. On hearing that God had blessed Obed-edom because of the presence of the Ark in his house, David had the Ark brought to Zion by the Levites, while he himself, "girded with a linen ephod ... danced before the Lord with all his might" and in the sight of all the public gathered in Jerusalem—a performance that caused him to be scornfully rebuked by his first wife, Saul's daughter Michal. In Zion, David put the Ark in the tabernacle he had prepared for it, offered sacrifices, distributed food, and blessed the people and his own household. The Levites were appointed to minister before the Ark. David's plan of building a temple for the Ark was stopped at the advice of God. The Ark was with the army during the siege of Rabbah; and when David fled from Jerusalem at the time of Absalom's conspiracy, the Ark was carried along with him until he ordered Zadok the priest to return it to Jerusalem. When Abiathar was dismissed from the priesthood by King Solomon for having taken part in Adonijah's conspiracy against David, his life was spared because he had formerly borne the Ark. Solomon worshipped before the Ark after his dream in which God promised him wisdom. During the construction of Solomon's Temple, a special inner room, named Kodesh Hakodashim (Eng. Holy of Holies), was prepared to receive and house the Ark; and when the Temple was dedicated, the Ark—containing the original tablets of the Ten Commandments—was placed therein. When the priests emerged from the holy place after placing the Ark there, the Temple was filled with a cloud, "for the glory of the Lord had filled the house of the Lord". When Solomon married Pharaoh's daughter, he caused her to dwell in a house outside Zion, as Zion was consecrated because of its containing the Ark. King Josiah also had the Ark returned to the Temple, from which it appears to have been removed by one of his predecessors (cf. 2 Chron. 33-34 and 2 Kings 21-23). In Rabbinic literature, the final disposition of the Ark is disputed. Some rabbis hold that it must have been carried off to Babylon, while others hold that it must have been hidden lest it be carried off into Babylon and never brought back. A late 2nd-century rabbinic work known as the Tosefta states the opinions of these rabbis that Josiah, the king of Judah, stored away the Ark, along with the jar of manna, and a jar containing the holy anointing oil, the rod of Aaron which budded and a chest given to Israel by the Philistines. This was said to have been done in order to prevent their being carried off into Babylon as had already happened to the other vessels. 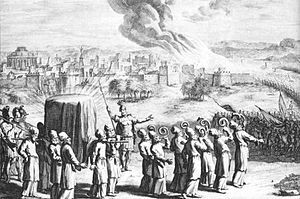 Rabbi Eliezer and Rabbi Shimon, in the same rabbinic work, state that the Ark was, in fact, taken into Babylon. Rabbi Yehudah, dissenting, says that the Ark was stored away in its own place, meaning, somewhere on the Temple Mount. Archaeological evidence shows strong cultic activity at Kiriath Jearim in the 8th and 7th centuries BCE, well after the ark was supposedly removed from there to Jerusalem. In particular, archaeologists found a large elevated podium, associated with the Northern Kingdom and not the Southern Kingdom, which may have been a shrine. Thomas Römer states this indicates that the ark was not moved to Jerusalem until much later, possibly during the reign of King Josiah. He argues that this explains why the ark featured prominently in the history before Solomon, but not after. He says that 2 Chronicles 35:3 indicates that it was moved during King Josiah's reign. Many Bible scholars believe the story of the Ark was written independently around the 8th century in a text referred to as the "Ark Narrative" and then incorporated into the main biblical narrative just before the exile into Babylon. 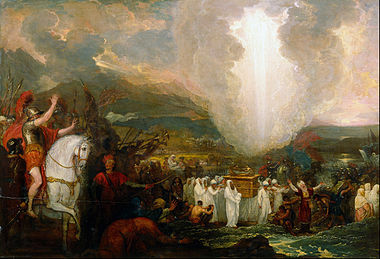 Israel Finkelstein believes that the ark never existed, but that elevated platform was constructed as a shrine to the story of the ark. Evidence shows that it was common practice for polytheist nomads to carry sacred stones or idols in boxes like the ark. Archaeologists believe the ark may have contained pagan idols that were thousands of years old. The Bible often connected the ark with war and fertility, leading Römer to believe it may have contained Baal and Asherah. The Ark is first mentioned in the Book of Exodus, and then numerous times in Deuteronomy, Joshua, Judges, I Samuel, II Samuel, I Kings, I Chronicles, II Chronicles, Psalms and Jeremiah. And it shall be that when you multiply and become fruitful in the land, in those days—the word of the LORD—they will no longer say, 'The Ark of the Covenant of the LORD' and it will not come to mind; they will not mention it, and will not recall it, and it will not be used any more. Rashi comments on this verse that "The entire people will be so imbued with the spirit of sanctity that God's Presence will rest upon them collectively, as if the congregation itself was the Ark of the Covenant." The records show that it was the prophet Jeremiah who ... prompted by a divine message ... gave orders that the Tent of Meeting and the ark should go with him. Then he went away to the mountain from the top of which Moses saw God's promised land. When he reached the mountain, Jeremiah found a cave-dwelling; he carried the tent, the ark, and the incense-altar into it, then blocked up the entrance. Some of his companions came to mark out the way, but were unable to find it. When Jeremiah learnt of this he reprimanded them. "The place shall remain unknown", he said, "until God finally gathers his people together and shows mercy to them. The Lord will bring these things to light again, and the glory of the Lord will appear with the cloud, as it was seen both in the time of Moses and when Solomon prayed that the shrine might be worthily consecrated." The "mountain from the top of which Moses saw God's promised land" would be Mount Nebo, located in what is now Jordan. In the New Testament, the Ark is mentioned in the Letter to the Hebrews and the Revelation to St. John. Hebrews 9:4 states that the Ark contained "the golden pot that had manna, and Aaron's rod that budded, and the tablets of the covenant." Revelation 11:19 says the prophet saw God's temple in heaven opened, "and the ark of his covenant was seen within his temple." Catholic scholars connect this verse with the Woman of the Apocalypse in Revelation 12:1, which immediately follows, and say that the Blessed Virgin Mary is identified as the "Ark of the New Covenant." Carrying the saviour of mankind within her, she herself became the Holy of Holies. This is the interpretation given in the third century by Gregory Thaumaturgus, and in the fourth century by Saint Ambrose, Saint Ephraem of Syria and Saint Augustine. The Catholic Church teaches this in the Catechism of the Catholic Church: "Mary, in whom the Lord himself has just made his dwelling, is the daughter of Zion in person, the Ark of the Covenant, the place where the glory of the Lord dwells. She is 'the dwelling of God . . . with men"
In the Gospel of Luke, the author's accounts of the Annunciation and Visitation are constructed using eight points of literary parallelism to compare Mary to the Ark. Saint Athanasius, the bishop of Alexandria, is credited with writing about the connections between the Ark and the Virgin Mary: "O noble Virgin, truly you are greater than any other greatness. For who is your equal in greatness, O dwelling place of God the Word? To whom among all creatures shall I compare you, O Virgin? You are greater than them all O (Ark of the) Covenant, clothed with purity instead of gold! You are the Ark in which is found the golden vessel containing the true manna, that is, the flesh in which Divinity resides" (Homily of the Papyrus of Turin). And their prophet said to them, "Indeed, a sign of his kingship is that the chest (tābūt) will come to you in which is assurance (sakīnatun) from your Lord and a remnant of what the family of Moses (Mūsā) and the family of Aaron (Hārūn) had left, carried by the angels. Indeed in that is a sign for you, if you are believers." The Arabic word sakīna (variously translated "peace of reassurance" or "spirit of tranquility") is related to the post-Biblical Hebrew shekhinah, meaning "dwelling or presence of God". The Islamic scholar Al Baidawi mentioned that the sakina could be Tawrat, the Books of Moses. According to Al-Jalalan, the relics in the Ark were the fragments of the two tablets, rods, robes, shoes, mitre of Moses and the vase of manna. Al-Tha'alibi, in Qisas Al-Anbiya (The Stories of the Prophets), has given an earlier and later history of the Ark. 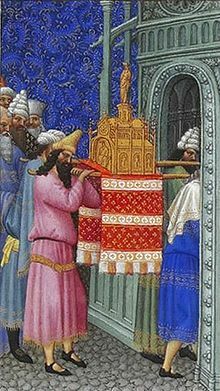 According to Uri Rubin the Ark of the Covenant has a religious basis in Islam, and Islam gives it special significance. Since its disappearance from the Biblical narrative, there have been a number of claims of having discovered or of having possession of the Ark, and several possible places have been suggested for its location. 2 Maccabees 2:4-10, written around 100 BC, says that the prophet Jeremiah, "being warned by God" before the Babylonian invasion, took the Ark, the Tabernacle, and the Altar of Incense, and buried them in a cave on Mount Nebo, informing those of his followers who wished to find the place that it should remain unknown "until the time that God should gather His people again together, and receive them unto mercy." Mount Nebo is also described in the Bible (Deuteronomy 34) as the site from which Moses views the Promised Land, and apparently also is his final burial place. Mount Nebo is approximately 47 km (29 miles) slightly south of due east from Jerusalem, near the east bank of the Jordan River. 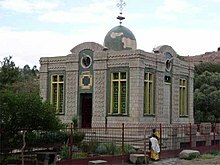 The Chapel of the Tablet at the Church of Our Lady Mary of Zion in Axum allegedly houses the original Ark of the Covenant. The Ethiopian Orthodox Tewahedo Church claims to possess the Ark of the Covenant, or Tabot, in Axum. The object is currently kept under guard in a treasury near the Church of Our Lady Mary of Zion. Replicas of the Axum tabot are kept in every Ethiopian Orthodox Tewahedo church, each with its own dedication to a particular saint; the most popular of these include Mary, George and Michael. The Kebra Nagast was composed to legitimise the Solomonic dynasty, which ruled the Ethiopian Empire following its establishment in 1270. It narrates how the real Ark of the Covenant was brought to Ethiopia by Menelik I with divine assistance, while a forgery was left in the Temple in Jerusalem. Although the Kebra Nagast is the best-known account of this belief, it predates the document. Abu al-Makarim, writing in the last quarter of the twelfth century, makes one early reference to this belief that they possessed the Ark. "The Abyssinians possess also the Ark of the Covenant", he wrote, and, after a description of the object, describes how the liturgy is celebrated upon the Ark four times a year, "on the feast of the great nativity, on the feast of the glorious Baptism, on the feast of the holy Resurrection, and on the feast of the illuminating Cross." In his 1992 book The Sign and the Seal, British writer Graham Hancock suggests, contrary to the Kebra Nagast, that the ark spent several years in Egypt before it came to Ethiopia via the Nile River, where it was kept in the islands of Lake Tana for about four hundred years and finally taken to Axum. Archaeologist John Holladay of the University of Toronto called Hancock's theory "garbage and hogwash," while Edward Ullendorff, a former Professor of Ethiopian Studies at the University of London, said he "wasted a lot of time reading it." On 25 June 2009, the patriarch of the Orthodox Church of Ethiopia, Abune Paulos, said he would announce to the world the next day the unveiling of the Ark of the Covenant, which he said had been kept safe and secure in a church in Axum, Ethiopia. The following day, on 26 June 2009, the patriarch announced that he would not unveil the Ark after all, but that instead he could attest to its current status. The Lemba people of South Africa and Zimbabwe have claimed that their ancestors carried the Ark south, calling it the ngoma lungundu or "voice of God", eventually hiding it in a deep cave in the Dumghe mountains, their spiritual home. On 14 April 2008, in a UK Channel 4 documentary, Tudor Parfitt, taking a literalist approach to the Biblical story, described his research into this claim. He says that the object described by the Lemba has attributes similar to the Ark. It was of similar size, was carried on poles by priests, was not allowed to touch the ground, was revered as a voice of their God, and was used as a weapon of great power, sweeping enemies aside. In his book The Lost Ark of the Covenant (2008), Parfitt also suggests that the Ark was taken to Arabia following the events depicted in the Second Book of Maccabees, and cites Arabic sources which maintain it was brought in distant times to Yemen. One Lemba clan, the Buba, which was supposed to have brought the Ark to Africa, have a genetic signature called the Cohen Modal Haplotype. This suggests a male Semitic link to the Levant. Lemba tradition maintains that the Ark spent some time in Sena in Yemen. Later, it was taken across the sea to East Africa and may have been taken inland at the time of the Great Zimbabwe civilization. According to their oral traditions, some time after the arrival of the Lemba with the Ark, it self-destructed. Using a core from the original, the Lemba priests constructed a new one. This replica was discovered in a cave by a Swedish German missionary named Harald von Sicard in the 1940s and eventually found its way to the Museum of Human Science in Harare. Parfitt had this artifact radio-carbon dated to about 1350, which coincided with the sudden end of the Great Zimbabwe civilization. French author Louis Charpentier claimed that the Ark was taken to the Chartres Cathedral by the Knights Templar. 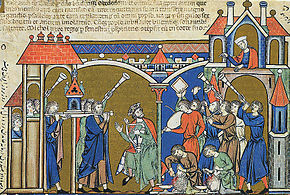 One author has theorised that the Ark was taken from Jerusalem to the village of Rennes-le-Château in Southern France. Karen Ralls has cited Freemason Patrick Byrne, who believes the Ark was moved from Rennes-le-Château at the outbreak of World War I to the United States. The Ark of the Covenant was said to have been kept in the Basilica of St. John Lateran, surviving the pillages of Rome by Alaric I and Gaiseric but lost when the basilica burned. "Rabbi Eliezer ben José stated that he saw in Rome the mercy-seat of the temple. There was a bloodstain on it. On inquiry he was told that it was a stain from the blood which the high priest sprinkled thereon on the Day of Atonement." In 2003, author Graham Phillips hypothetically concluded that the Ark was taken to Mount Sinai in the Valley of Edom by the Maccabees. Phillips claims it remained there until the 1180s, when Ralph de Sudeley, the leader of the Templars, found the Maccabean treasure at Jebel al-Madhbah, and returned home to his estate at Herdewyke in Warwickshire, England taking the treasure with him. During the turn of the 20th century British Israelites carried out some excavations of the Hill of Tara in Ireland looking for the Ark of the Covenant—the Royal Society of Antiquaries of Ireland campaigned successfully to have them stopped before they destroyed the hill. In 1922 in the Valley of the Kings in Egypt, the royal tomb of the Pharaoh Tutankhamun (KV62) was opened by Howard Carter and Lord Carnarvon. Among the artifacts was a processional ark, listed as Shrine 261, the Anubis Shrine. Almost immediately after publication of the photographs of this sensational archaeological find, some claimed that the Anubis Shrine could be the Ark of the Covenant. John M. Lundquist, author of The Temple of Jerusalem: Past, Present, and Future (2008), discounts this idea. The Anubis Shrine measures 95 centimetres (37 in) long, 37 centimetres (15 in) wide, and 54.3 centimetres (21.4 in) high in the shape of a pylon. The Biblical Ark of the Covenant is approximately 133 centimetres (52 in) long, 80 centimetres (31 in) wide, and 80 centimetres (31 in) high in the shape of a rectangular chest. Lundquist observes that the Anubis Shrine is not strictly analogous to the Ark of the Covenant; it can only be said that it is "ark-like", constructed of wood, gessoed and gilded, stored within a sacred tomb, "guarding" the treasury of the tomb (and not the primary focus of that environment), that it contains compartments within it that store and hold sacred objects, that it has a figure of Anubis on its lid, and that it was carried by two staves permanently inserted into rings at its base and borne by eight priests in the funerary procession to Tutankhamun's tomb. Its value is the insight it provides to the ancient culture of Egypt. The Ark of the Covenant is the main plot device in Steven Spielberg's 1981 adventure film Raiders of the Lost Ark, which depicts it as located by Indiana Jones in the Egyptian city of Tanis in 1936. It is mentioned briefly in Indiana Jones and the Last Crusade (1989) and appears in a cameo in Indiana Jones and the Kingdom of the Crystal Skull (2008). In the Danish family film The Lost Treasure of the Knights Templar from 2006, the main part of the treasure found in the end is the Ark of the Covenant. The power of the Ark comes from static electricity stored in separated metal plates like a giant Leyden jar. Yom HaAliyah (Aliyah Day) (Hebrew: יום העלייה‎) is an Israeli national holiday celebrated annually on the tenth of the Hebrew month of Nisan to commemorate the Israelites crossing the Jordan River into the Land of Israel while carrying the Ark of the Covenant. ^ Ackerman, Susan (2000). "Ark of the Covenant". In Freedman, David Noel; Myers, Allen C. (eds.). Eerdmans Dictionary of the Bible. Eerdmans. p. 102. ^ "Deu 10:1-5 NIV - Tablets Like the First Ones - At that - Bible Gateway". Bible Gateway. ^ ""Four feet"; see Exodus 25:12, majority of translations. "Four corners" in KJV". Biblestudytools.com. Retrieved 2012-08-17. ^ "Ark of the Covenant". Jewish Encyclopedia. Retrieved 1 May 2012. ^ a b Amanda Borschel-Dan (10 January 2019). "Biblical site tied to Ark of the Covenant unearthed at convent in ventral Israel". The Times of Israel. ^ a b c Ariel David (30 Aug 2017). "The Real Ark of the Covenant may have Housed Pagan Gods". Haaretz. ^ K. L. Sparks, "Ark of the Covenant" in Bill T. Arnold and H. G. M. Williamson (eds. ), Dictionary of the Old Testament: Historical Books (InterVarsity Press, 2005), 91. ^ Callum Paton (Aug 30, 2017). "ISRAEL: ARCHAEOLOGISTS HUNTING THE ARK OF THE COVENANT BELIEVE ANCIENT RELIC MAY HAVE HELD PAGAN GODS". Newsweek. ^ Jeremiah 3:16, Tanach. Brooklyn, New York: ArtScroll. p. 1078. ^ a b c Ray, Steve (October 2005). "Mary, the Ark of the New Covenant". This Rock. 16 (8). Archived from the original on 29 June 2011. Retrieved 2 February 2011. ^ "CCC, 2676". Vatican.va. Retrieved 17 January 2016. ^ "Quran Surah Al-Baqara ( Verse 248 )". Irebd.com. Archived from the original on 2018-02-27. Retrieved 2018-02-28. ^ a b Hughes, Patrick; Hughes, Thomas Patrick (1995) . A Dictionary of Islam. New Delhi: Asian Educational Services. p. 624. ISBN 9788120606722. Retrieved April 12, 2017. ^ Rubin, Uri (2001). "Traditions in Transformation: The Ark of the Covenant and the Golden Calf in Biblical and Islamic Historiography" (PDF). Retrieved 2016-11-17. ^ Cf. Deuteronomy 34:1-3 and 2 Maccabees 2:4-8. ^ Hancock, Graham (1992). The Sign and the Seal: The Quest for the Lost Ark of the Covenant. New York: Crown. ISBN 0517578131. ^ Hiltzik, Michael H. (June 9, 1992). "Does Trail to Ark of Covenant End Behind Aksum Curtain? A British author believes the long-lost religious object may actually be inside a stone chapel in Ethiopia". Los Angeles Times. p. 1. ^ The Lost Ark of the Covenant by Tudor Parfitt, published by HarperCollins 2008. ^ a b A Lead on the Ark of the Covenant, by David Van Biema Thursday, Time.com, Feb. 21, 2008. ^ "Debates & Controversies - Quest for the Lost Ark". Channel4.com. 2008-04-14. Archived from the original on May 13, 2008. Retrieved 2010-03-07. ^ Louis Charpentier, Les Mystères de la Cathédrale de Chartres (Paris: Robert Laffont, 1966), translated as The Mysteries of Chartres Cathedral (London: Research Into Lost Knowledge Organisation, 1972). ^ J. Salmon, A Description of The Works of Art of Ancient and Modern Rome, Particularly In Architecture, Sculpture & Painting, Volume One, page 108 (London: J. Sammells, 1798). ^ Midrash Tanḥuma. p. 33. Retrieved 4 June 2017. ^ Ivan McAvinchey. "News 2006 (March 9)". Rsai.ie. Archived from the original on 2009-03-08. Retrieved 2010-03-07. 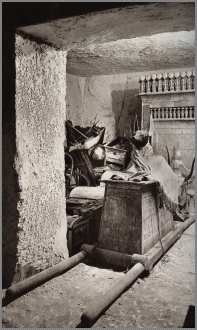 ^ Photographs by Harry Burton, The Griffith Institute, Tutankhamun: Anatomy of an Excavation: The Howard Carter Archives. ^ Lundquist, John M. The Temple of Jerusalem: past, present, and future, Chapter 2 "The World of the First Temple", pp.66-67, © 2008 by John M. Lundquist, first published 2008, Praeger Publishers, 88 Post Road West, Westport, CT 06881 ISBN 978-0-275-98339-0 www.praeger.com. ^ Graham, Lynn; Graham, David (2003). I Am.. The Power and the Presence. Kindred Productions. p. 38. ISBN 9780921788911. ^ McLoughlin, Tom (2014). A Strange Idea of Entertainment - Conversations with Tom McLoughlin. BearManor Media. p. 66. ^ "Tempelriddernes skat". Filmcentralen / streaming af danske kortfilm og dokumentarfilm (in Danish). Retrieved 16 April 2019. ^ Atali, Amichai (19 June 2016). "Government to pass new holiday: 'Aliyah Day'". Ynetnews. Retrieved 23 April 2017. ^ Yashar, Ari (24 March 2014). "Knesset Proposes Aliyah Holiday Bill". Israel National News. Retrieved 23 April 2017. Fisher, Milton C., The Ark of the Covenant: Alive and Well in Ethiopia?. Bible and Spade 8/3, pp. 65–72, 1995. Foster, Charles, Tracking the Ark of the Covenant. Monarch, 2007. Hertz, J.H., The Pentateuch and Haftoras. Deuteronomy. Oxford University Press, 1936. Ritmeyer, L., The Ark of the Covenant: Where It Stood in Solomon's Temple. Biblical Archaeology Review 22/1: 46-55, 70-73, 1996. 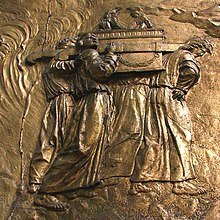 Wikimedia Commons has media related to Ark of the Covenant. Smithsonian.com "Keepers of the Lost Ark?" Derby, Josiah, "The Gold of The Ark", Jewish Bible Quarterly. Schatz, Elihu, "The Weight of The Ark of The Covenant", Jewish Bible Quarterly.